Have you ever found yourself so wound up you simply cannot untangle what it is that is bothering you the most? Entangled thoughts make you feel like you can’t think clearly because you have an inner dialogue going on that you have created about some aggressive, relationship-ruining, sexual, logic-defying, bewildering, even violent content running through your mind. You may experience a healthy dose of guilt and shame alongside that content, because you wonder how on earth you can be a good or sane person and think this way. That is how OCD (obsessive compulsive disorder) thoughts operate. 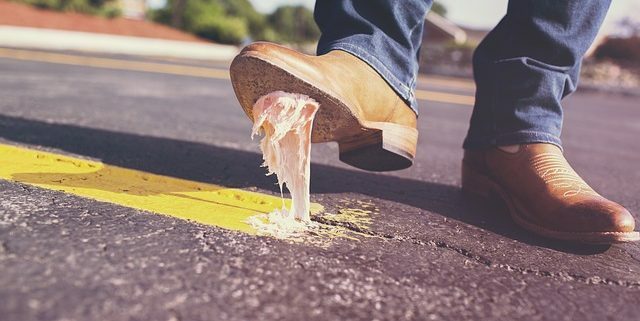 Ever unlocked your car in the parking lot of the grocery store with a big ole bag of groceries in your hand and looked down to find you just stepped in a wad of gum? Gum that has been baking on the asphalt to a nice stretchy glob of stickiness? Then you spend 10 minutes trying to get the mess off your shoe while the ice cream in your grocery bag slowly turns to mush. Maybe you succeeded in getting a bit off, but you also did an excellent job of spreading around what remained into an even wider area of that disgusting suction you now have with every step.